Home Loan EMI is an important part of borrower’s life till Home Loan is closed. Entire family think, eat, drink and sleep Home Loan EMI. I mean to say, all imp decisions of family revolve around this income “guzzler”. As home loan is long term commitment therefore we come across various situations and turning points where we don’t know how to handle Home Loan EMI. Any mishandling can have long term financial implications. 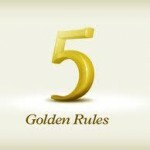 In this post on “5 Golden Rules of Home Loan EMI”, we will discuss 5 such imp rules which should be guiding light to decide. 1. Home Loan EMI as a % of Income: Recently you might have observed lot of publicity around new home loan products under the broad umbrella of Flexi EMI. It is not a new concept, you can voluntarily increase your EMI or decrease at the time of prepayment provided home loan tenure is not breached. Also under floating interest rate, you can prepay any time without any penalty. Common terms used for Flexi EMI are “Step Up” and “Step Down”. Only difference is that in such products, any increase / decrease is inbuilt with the product. Basically, these products are designed based on certain assumptions. For example, your income will increase 10% p.a. which may or may not be true. Life is uncertain and it will be more uncertain in coming years. The magnitude of uncertainty is increasing day by day. Recently one of my friends company was acquired by global social media giant. She was so happy to be part of global brand and threw the party for all friends…Next day she received pink slip and was informed that Social Media company would like to retain only a few employees of acquired company. Now she has home loan to manage and entire financial calculations went haywire. The point i am trying to make is that under uncertain environment you cannot commit Flexi EMI. It’s a different matter if you are in the govt job. Assuming you and your wife opted for Step Up EMI option with assumption of 10% increase in income. Unfortunately, your wife has to leave the job to extend the family. It will upset household expenditure and also the probability of Home Loan EMI default is very high, in this case. The golden rule to follow is that you should always pay 40% or 50% (depending on comfort level) of your monthly income as Home Loan EMI. Let say, your salary at the time of availing Home Loan was Rs 1 lakh and EMI was Rs 40k. This year, you received 12% increment therefore you should increase your EMI in the same proportion i.e. 12%. Revised EMI will be Rs 44,800 and Salary is Rs 1,12,000. Take another example, your salary is Rs 50,000 and EMI is Rs 20,000. You availed “Step Up” Flexi EMI. Your employer decided not to give any hike this year, but your EMI will increase by Rs 2,000. It will burden your financials. Follow the golden rule of Home Loan EMI should be 40% / 50% of Monthly Income. The control to increase the EMI should be in your hand. 2. Never Reduce EMI at the time of Prepayment: At the time of making prepayment, the strong urge is to reduce Home Loan EMI. Reason being entire family is tired of cutting down expenses, the common consensus in the family is to cut Home Loan EMI. You may cut down on prepayment and utilize for family activities but to reduce EMI is not a wise decision. Any reduction in EMI will increase your interest outflow thus increase the overall cost of property. Home Loan prepayment is normally done on receipt of Annual Performance Bonus or on maturity of an investment. Prepayment will reduce your Home Loan tenure. I mentioned in one of my post that you should try to close Home Loan before kids college education start. 3. Auto Debit Home Loan EMI: I always suggest my clients to opt for Auto Debit of Home Loan EMI. Normally banks prefer an account in the same bank though it is not mandatory or compulsory. You may opt for ECS mandate. Cheque payment is prone to a manual error which may result in payment default. Even in cases where banks failed to deposit cheques on time, it impacted CIBIL Score of the borrower. In few cases, there was signature mismatch or date was wrongly mentioned. To avoid all these issues, it is always advisable to opt for Auto Debit of Home Loan EMI. Preferably, you should link ECS with your salary or current account in which you receive your income. Default in auto debit is also very common as many people forget to transfer Home Loan EMI from salary account to Auto Debit Account. 4. Home Loan EMI Contingency Fund: As i always suggest to create 2 types of contingency funds i.e. one for household expenditure and second for Home Loan EMI. It is created for any unforeseen circumstances like job loss or loss of income due to health issues. This contingency fund should be 3 / 6 months EMI depending on the nature and stability of the job. In the case of single earning member, entire home loan amount should be covered by Online Term Insurance Plan. Contingency fund money should be kept separate and you should never utilize the same. You may invest this amount in Liquid funds, you can withdraw it within 1 – 2 days. 5. EMI Holiday: Not many people are aware of this concept. If you face any financial problem then you can discuss with your bank rather defaulting on Home Loan EMI. Depending on your payment record and if the bank is convinced that your problem is genuine then you may get 3 months EMI Holiday. Home Loan EMI payment default impacts your CIBIL score negatively therefore EMI holiday will come to your rescue. EMI Holiday is not guaranteed and is at the sole discretion of the bank. In some Home Loan products, it is bundled with the product wherein a borrower can avail once or twice during the Home Loan tenure. This facility should not be misused and remember that if you are not paying EMI then your interest is increasing. EMI Holiday should be used only during the emergency. To summarize, nothing can replace proper financial planning. At the same time, no planning is perfect in this world. Life throws some unexpected situations. We can’t avoid or control, but it is advisable that we should be better prepared for such situations. By following golden rules of Home Loan EMI, we can manage and control our EMI in a better way.